Access your loft with our safe, sturdy and professionally fitted loft ladders. Choose from several options to best suit your needs or speak to us for advice on the best one for you. Loft ladders can only be provided as part of a loft flooring system purchase. To arrange a survey please visit our booking page, select your location and choose a suitable time. Aluminium ladders start from only 5.3kg, so can be easily pulled down or stowed with the included pole. Our entry-level Abru Arrow 3-Section has a guide bar to keep it straight, whereas the Abru Easy Stow has an additional spring to take the weight of the ladder making stowage even easier. If you have a flip-down hatch, it's likely that no modification will be required - though you may opt to replace the door with one which can be opened using the included ladder pole and catch. If your door is on top of your hatch and opens up the way, your door will need to be modified with hinges and a catch to fit inside the hatch and flip down to open. 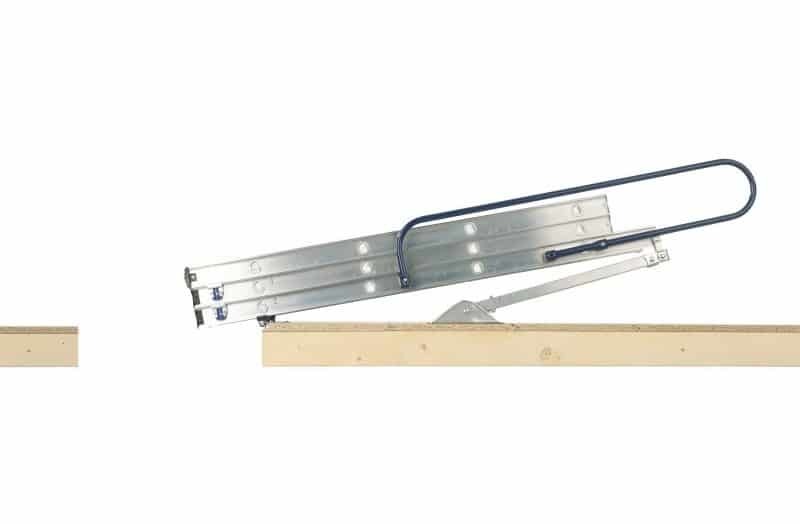 Loft ladders slide up in 2 or 3 sections to lie flat on the loft floor. 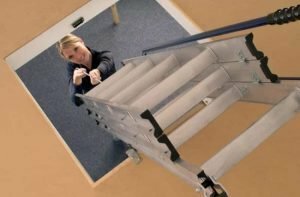 When choosing a ladder, it's important to consider the space the ladder needs to swing through in the hallway and in the loft space when stowing or retrieving it. 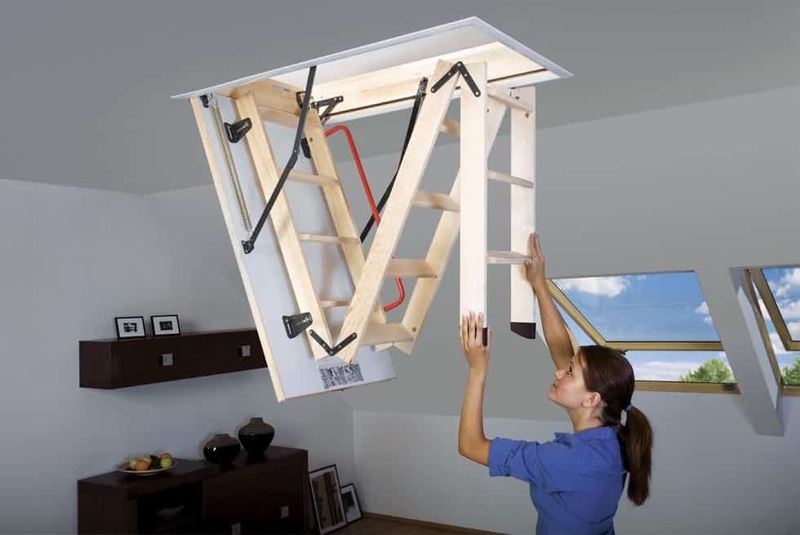 If space is limited, other options are to choose a telescopic ladder or to move the hatch location. Concertina ladders can fold into a really small space, with the smallest hatch size being only 50cm wide by 80cm long. Also, since they are stored within the area of their own hatch, the won't take up any additional floor space in the loft like a sliding ladder would. With minimal swing clearance needed on the landing concertina ladders are extremely handy in a tight spot. A small hatch size doesn't restrict these ladders just to low ceilings. Even the smallest hatch size can reach up to 3.3m from floor to ceiling - nearly 11ft. Opting for one of the larger hatches raises the height limit to a towering 4.3m (over 14ft). These ladders have been engineered to be extremely easy to operate - without sacrificing their strength. The Elite and Supreme versions require only 3kg of force to operate yet have a load rating of 200kg per step. 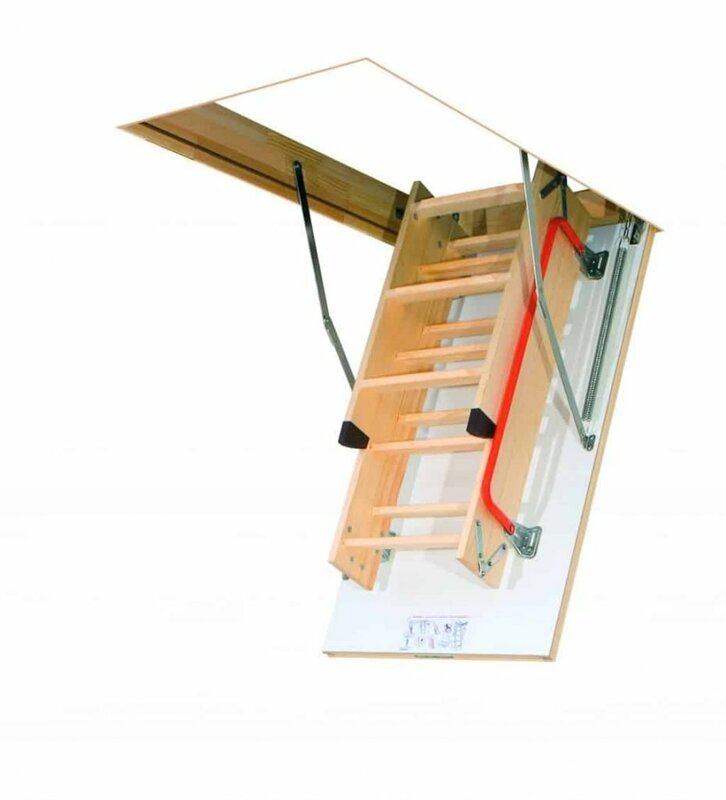 Wooden loft ladders come pre-fitted into their own hatch and the whole unit is installed in one go. The hatch opening is about 1200mm long, allowing plenty of room to access the loft, even if carrying large suitcases or other bulky items. 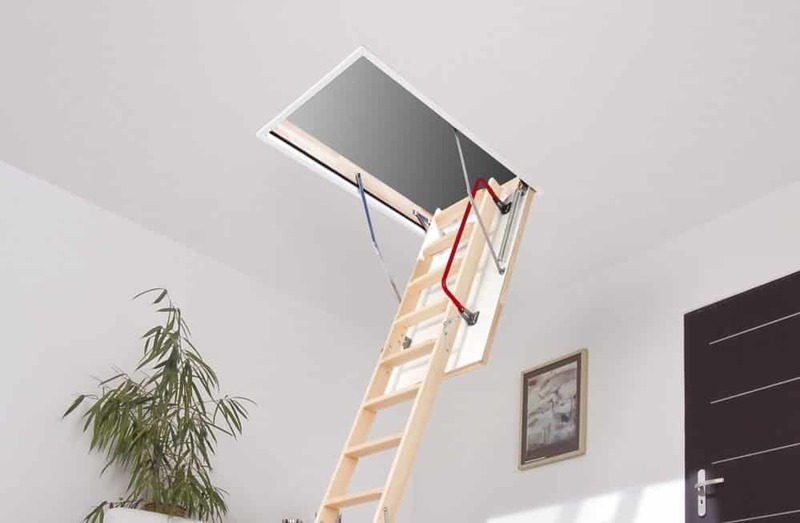 Since the ladder stows in the hatch door and not on the loft floor like an aluminium ladder, overall you lose less floor space than with an aluminium ladder. Loft ladders are heavy, especially well constructed ones! 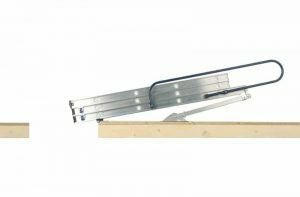 Our loft ladders feature a carefully calibrated spring balanced mechanism which balances the weight of the loft ladder when opening and closing. This means that once you open the lock, the ladder system will open just enough for you to pull down the ladder with no risk of injury. When closing, once the ladder is folded back into position, the user only needs to apply a small of pressure to push the open system back into its ‘ajar’ position, the rest of the operation is completed with the operating handle. Ascending and descending ladders carries with it inherent risks. Wooden loft ladders feature extra deep grooved treads for maximum grip and comfort - even in slippers! Our ladder timber treads are 80mm deep and 300mm wide (340mm on our Luxury ladders) - much more comfortable than the narrow D-shaped rungs found on aluminium ladders, and deeper than most other wooden ladders on the market. Insulated with 2"of energy-saving polystyrene and sealed to prevent draughts. Loft hatches can be standard sized or made larger to suit your choice of loft ladders and space available. If your hatch feels a bit small when trying to get in and out or when storing larger items such as suitcases, why not extend it slightly to give a little more room. We can replace your flip-down hatch with a larger one (726x566mm) or with a custom access panel door for larger sizes. Occasionally, house-builders choose a location for you hatch that doesn't suit your needs. It may be to keep it away from the stairs for safety, or it may be tucked away in a box room to avoid spoiling the aesthetics of your hallway. 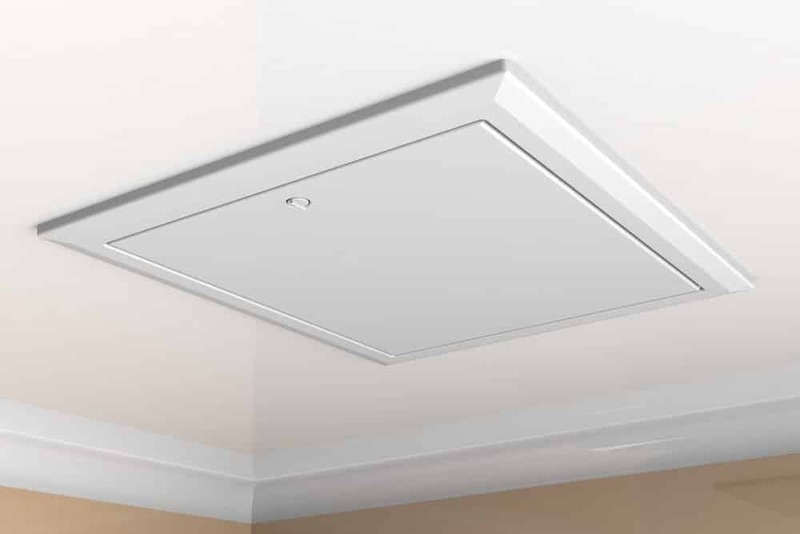 Regardless, we can help you choose a new location and fit a new, insulated and easy to open plastic hatch to provide easy access to your loft. Fill in your existing hatch and insert a new one in a new location. 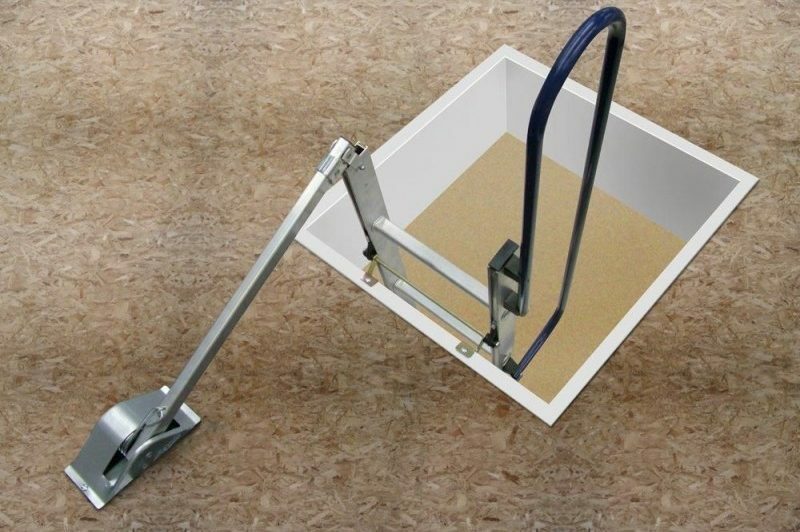 This may be required when your hatch has been installed in a location that makes it unsuitable for your preferred ladder choice. The ladder may not fit in the hallway in a way that allows you easy access, or it may clash with the timber trusses in the roof when you try to stow it. Either way, we can easily move your hatch - and in less time than you might think. To discuss any of these options please contact us or book a survey at a time that suits you. We bring our own ladders and take laser measurements inside your loft to quickly size up your flooring options. Surveys usually take less than 30mins and quotes are sent out within 48hrs.